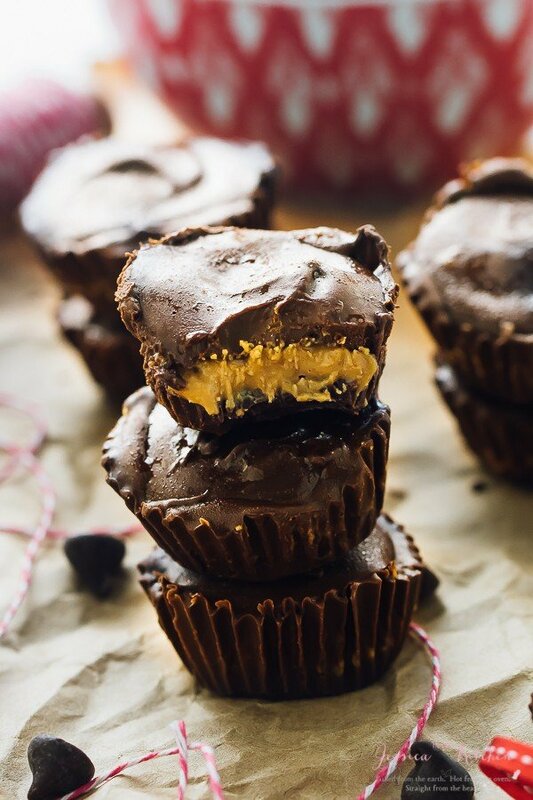 These 4-Ingredient Salted Caramel Chocolate Cups are a decadent holiday candy treat! They are incredibly easy to make, and are vegan, gluten free and no bake! Happy Halloween!! What are you doing today?! Are you going out to celebrate or did you do that this weekend already?! Candy plans?! Movie plans? Spill! Anyway. 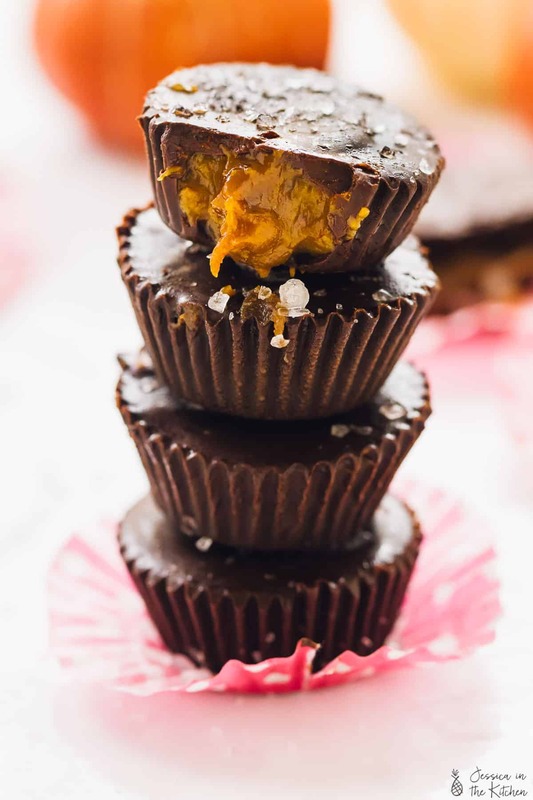 I’ll be probably watching a scary movie with my eyes covered the whole time and having these Salted Caramel Chocolate Cups. Yes! I made you 4-Ingredient Salted Caramel Chocolate Cups because they are (1) SO easy to make (2) 4-ingredients (one is salt!) – hello?! (3) no bake. Ugh, I can’t describe JUST how yummy these are so you definitely need to make them so you can dig in and enjoy too! 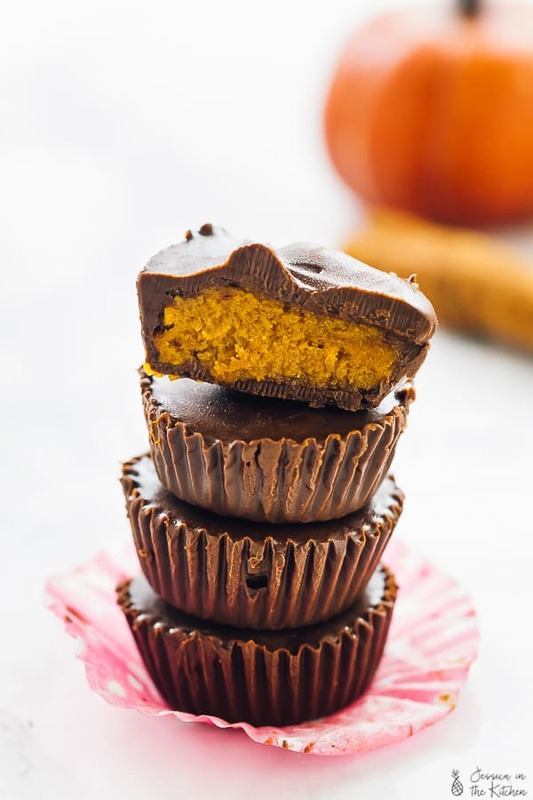 ICYMI, last week I made my pumpkin chocolate Cups too. 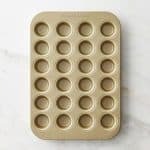 They were for another potential Halloween treat for you, and I realised soon after that these homemade candy treats are the bomb dot com. Soon after being you, after eating a few in the name of recipe testing. 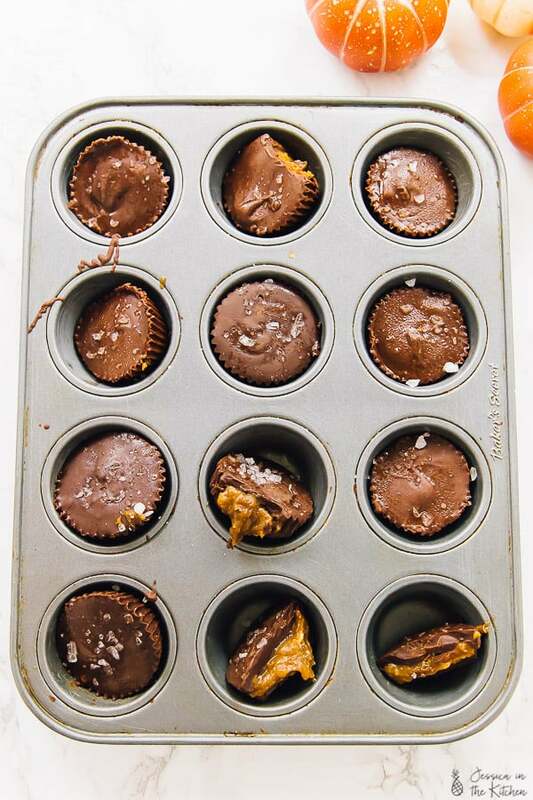 Truth is, I didn’t even plan to make these Salted Caramel chocolate Cups. I like to think they came to me. 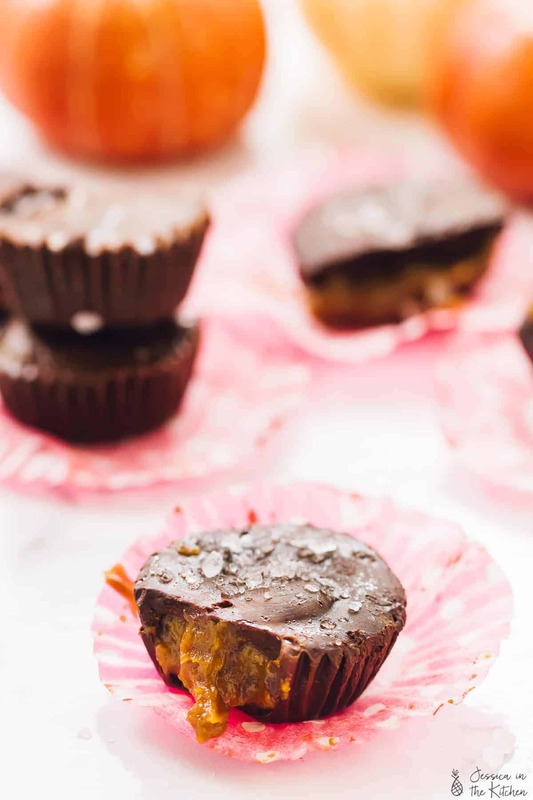 There’s been a small amount of homemade caramel leftover over in the fridge for a while with nothing to do with it (except eat it with a spoon) and since I still had some of these pumpkin chocolate Cups in the freezer, the idea came to me immediately. I mean, caramel and chocolate is pretty much THE perfect combination!! 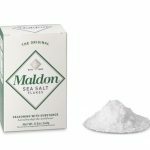 In case you’re wondering, the sea salt is the cherry on top. 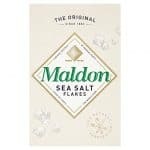 You want to sprinkle a few large bits on each, not fine salt. It provides the perfect contrast with the sweet caramel. The whole process to making these are pouring the melted chocolate in the liners, then the caramel, and then more chocolate + the sea salt. Pop into the freezer in between to chill, then devour. Dig in and enjoy friends! Happy Halloween again! Make these, then eat up! 3. Spoon a little bit of melted chocolate into each of the muffin liners, and spread it so it covers the bottom, as well as ¾ way up the liners with the back of your spoon. This will ensure the caramel filling is covered properly. Remove the mini muffin tin from the freezer and set beside this bowl. Dollop about ½ tablespoon of the caramel into each cup. 7. Pour the rest of chocolate equally over each cup to cover completely (I went all the way to the top of my liners). Place in the freezer to set for another 10 minutes or up to 30 minutes. Peel off liners, eat and enjoy!! 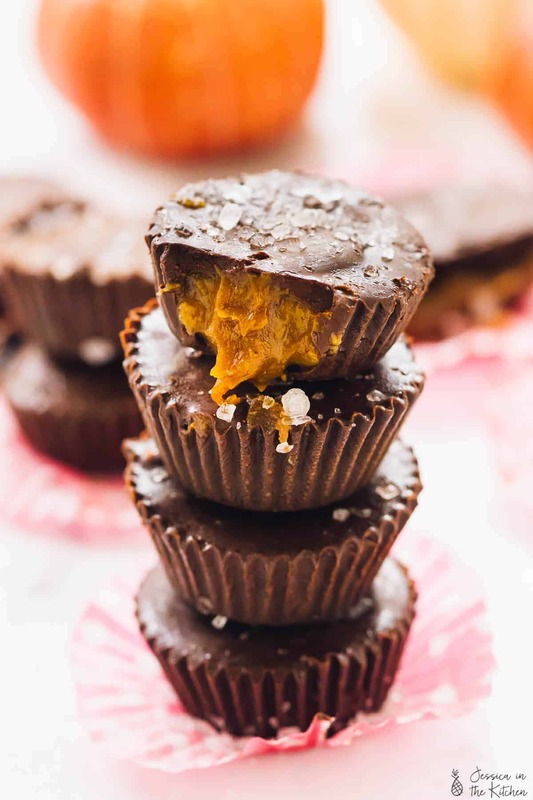 If you try this 4-Ingredient Salted Caramel Chocolate Cups recipe please let me know in the comment section below, or tag me on instagram with the hashtag #jessicainthekitchen! For more exclusive recipes follow me on Instagram AND on Snapchat: jessinkitchen. 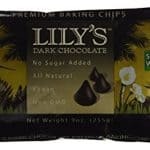 To ensure these are vegan make sure you use vegan dark chocolate chips! These chips from Lily’s are good!! 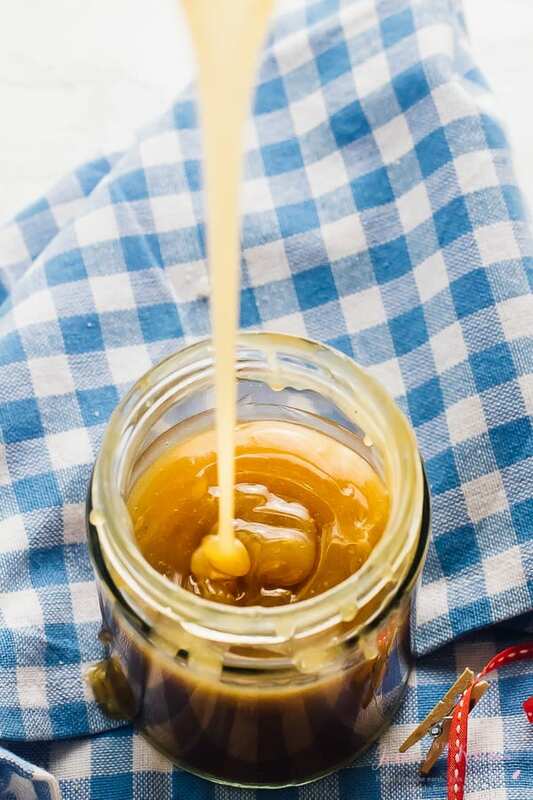 Do you have a recipe for the vegan caramel sauce? ooooh so delicious! I love salted caramel everythang and so cool that these are vegan, which means my sister-in-law can eat them, too! I’m so happy to hear!! Thanks so much for your feedback and you’re so welcome! !